You may not have to jet set far away to find an Ice Bar anymore. Just 2 &1/2 hours outside of New York City, in Northeastern Pennsylvania (in the town of Mountaintop), the owner of Damenti's Restaurant is putting up a free-standing Ice Bar in the restaurant's backyard. The Ice Bar will have a Pirate Theme and will hold up to about 40 people. 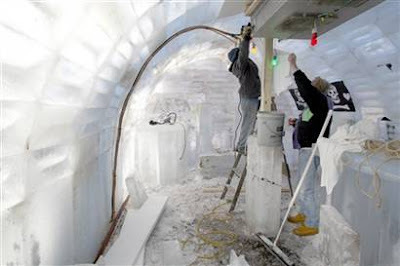 It is being made out of more than 50 tons of ice, and will be kept at a chilly 20 degrees so it doesn't melt. 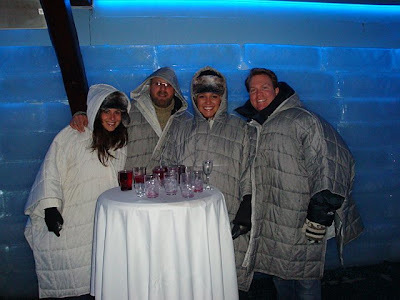 The only Ice Bar I've ever been to was in Reykjavik, Iceland. It was a lot of fun! I've heard there are some great ones in St.Tropez, Dubai, Tokyo, Cape Town, Australia and even Portugal. Closer to the U.S.- there will soon be this one in Pennsylvania, there's one in Orlando, Florida, and one is Las Vegas, Nevada. Have any of you guys ever been to an Ice Bar? If so, where?